I found Sage outside the post office in Heraklion, one Saturday morning. I still don't know why I stopped to play with her, but she had me under her spell right from the start. I had set out that morning to buy groceries, and came home with a young, excited, slightly scared, little black dog. We have been inseparable ever since. I bought an old car so that I could take her with me when I went to work in other parts of the island (and for fun trips of course). 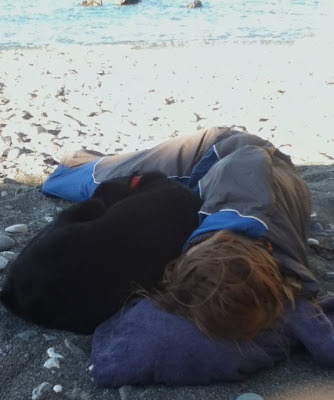 While I was living in Crete I was lucky enough to work in a dog-friendly environment, and would take her with me every day. My boss and colleagues loved playing with her! I made lots of friends among the dog walkers of Heraklion. 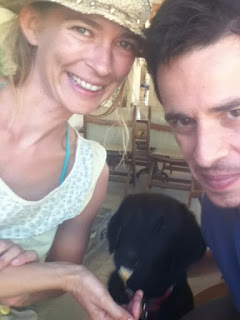 We would go out walking and talking along the walls, and sitting and drinking in the parks of Heraklion, with our dogs. We'd take the dogs on hikes, days out, for camping. 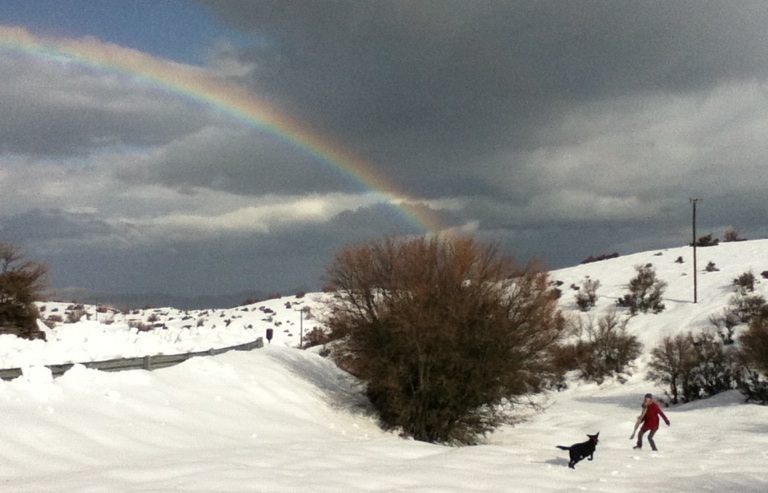 Sage has been to live concerts and festivals in the park, to archaeological excavations, to deserted beaches, and to snowy mountains. After two and a half great years we left Crete and moved to Cyprus. On the one hand, this was really difficult, as we had to leave people and places behind that we love. And, we get to spend more time with people we love here too. So I'm going to write up the experiences we had during our time in Crete, in the city of Heraklion where we lived, and the many amazing places we visited all over the island. At the same time, I'm reporting on the new places we're finding here in Cyprus. I'll be describing our typical walks and 'entertainment' in Larnaca where we are living, as well as the trips out to the Troodos mountains, to the beautiful coastal landscape of the Famagusta District, to the mountain villages and hiking trails of the Akamas Heights, and many more. This blog is intended as a travel guide based on personal experience. Traveling with Sage provides an excellent test. She is big (+30kg), black, and scary (to those who don't know her). However, she is very well behaved and calm, I really trust her, and she rarely barks. So I know that if we are welcomed in somewhere A) most other dogs, whatever their size, will also be welcome there, and B) the owners won't regret it.